The Design, Technology and Graphics classes at Narrabundah offer a wide range of topics: Architecture, Graphics, Interior Design, Landscape Design, Industrial Design and CAD/CAM Engineering. Students undertaking this course can study any or all of the streams. Any of them can combine to form a major, major minor or double major. This unit is designed to introduce students to architectural design standards, concepts, specifications, domestic applications of energy efficiency concepts, the design process, design briefs, Australian drawing standards, presentation and layout methods. Students will be introduced to industry standard Architectural software (Autodesk Revit Architecture) and will build 3 dimensional solutions to introductory exercises. They will learn the fundamentals of building materials and their properties and preliminary sketching techniques. Students will further develop their design and building information modeling (BIM) skills and investigate different architectural styles while working through a range of design problems. Students will investigate site planning and energy consumption in buildings of various functions. Students will investigate the impact of social demographics and changing human needs in communities, innovation in building materials and processes and economic considerations in building design and construction. Students will develop lighting and rendering skills to be able to colour print their work for display and portfolio. This unit provides an opportunity for students to be more self-directed and to physically construct architectural models, produce drawing sets and high quality renderings of their own solutions to an architectural design problem. The theoretical focus will be on developing a deeper knowledge and understanding of contemporary social and cultural aspects involved in the study of architecture and of innovative building materials and processes. This unit is designed to introduce students to concepts involved in large scale architectural and town planning principles, energy distribution, housing developments, retail outlets, cultural facilities, public space, recreation facilities, transport, airports, and environmental protection. Students will build 3 dimensional solutions to design problems in medium and large scale design projects such as apartment developments, institutional, commercial, cultural buildings, or suburban or small town redevelopment. Students will be given the opportunity to negotiate and design and construct their own major project that allows them to demonstrate the full range of skills and knowledge developed over the previous 4 terms of study and to work in-depth in a field of architecture that is of particular interest to them. Non-linear and organic design solutions will be encouraged through conceptual massing techniques. Advanced lighting and rendering techniques will be used to produce exceptional quality graphic displays of student design work. This unit provides an opportunity for students and teacher to negotiate a program that covers topics of special interest from advanced Revit modelling and rendering techniques to traditional pictorial drawing and water colour painting of architectural designs. The theoretical focus will be on developing an insight into futuristic trends and concepts involved in the study of architecture and of innovative building materials and processes. This unit introduces students to the design process; computer based 3D parametric modelling, materials and problem solving using concept development, converting 3 dimensional models to 2d engineering and technical representation and the application of Australian standards in drawing production. The software used is from the Autodesk suite available free to students. 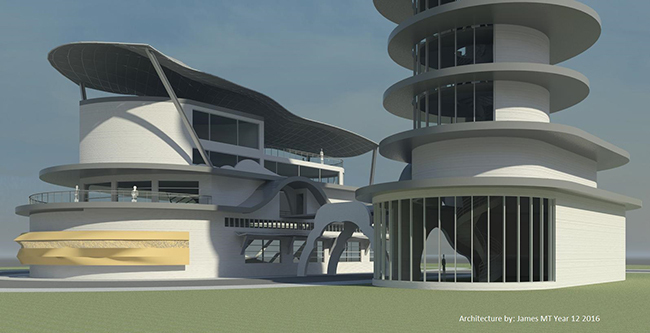 Autodesk AutoCAD , Inventor, & 3DSMAX are a worldwide industry leading applications. Three 3D printers are available for student use and a CNC router. This unit provides for a study of 2D and 3D Computer Aided Design and Drawing processes and techniques and covers a range of industry standard CAD applications while focusing on design and development of technological systems. Students will develop complex layout and engineering drawing principles and develop photo - realistic rendering methods and techniques to present their work in a modern context including 3D printing. Three 3D printers are available for student use. This unit is designed to introduce students to basic electronics engineering theory and develop their product design skills making projects using CAD/CAM and workshop tools. Students study electronic components and build circuits and do basic Arduino coding. As their skills develop, more complex electronic products are possible. Continuing on from the Systems Design unit, this unit explores aerodynamics, hydrodynamics and product design using these principles. Students explore underwater submersible technology and/or aerodynamics and efficiency in land vehicles. They solve problems by making a functioning submersible and/or C02 propelled car and develop their designs independently to improve performance. They use CAD/CAM skills and engineering principles to complete these processes. In the Graphic Design course, students begin with a basic introduction to graphic design concepts, methods and the design process, before exploring the history and standards of typographic practices and the role of typography in successful graphic design. They complete the course with the opportunity to undertake as much individual and self-directed study as possible, giving them an opportunity to study a particular area of interest within the graphic design course. The Design and Technology course integrates research, design and practical application related to technology and its application. Through researching current technology, designing and making projects, students develop knowledge and learn to construct technology applications in a range of design and technology disciplines. Students will be given the opportunity to develop design, theoretical and practical skills using the design process, information technologies and a range of machinery. Students will also be encouraged to build their understanding of the social, environmental and economic effects of design and technology in our society.